home › posts › 10 Famous Art Pieces Inspir... ten trees planted for every item purchased. Nature is what moves us. It's why we plant 10 trees for each item purchased in our store. And we're not alone in this feeling. Humans have longed to create since the beginning of their existence, and have always drawn inspiration from nature in some way, shape, or form — whether as cavemen drawing animals on walls or modern performance artists making a statement about the conservation of the earth. 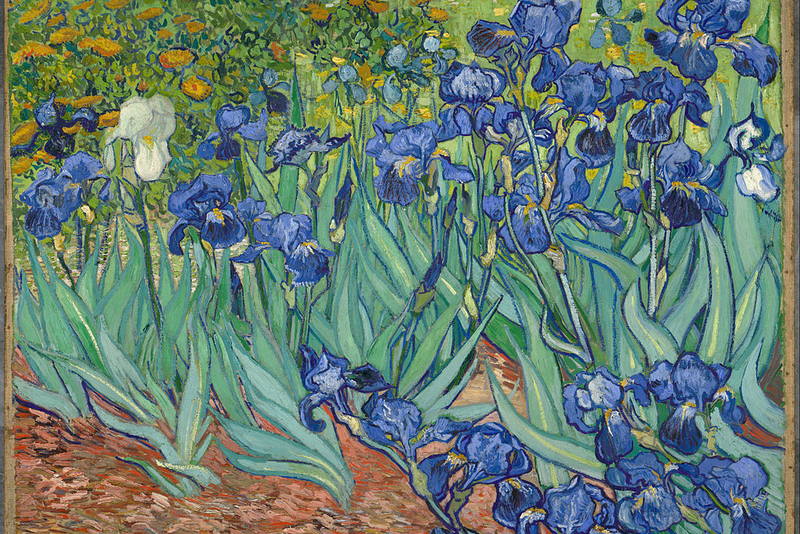 Van Gogh is one of the world's most famous modern artists. He wasn’t famous during his lifetime, but he was way ahead of his time. He made simple things like flowers have a life of their own on his canvases, with Irises in particular being a striking painting of life and air. You can feel the flowers breathing in this work. It's one of the best paintings of nature in the world! What a cool nature painting! The French painter Henri Rousseau first gained recognition for this somewhat naive yet beautiful painting of a tiger caught in a storm. 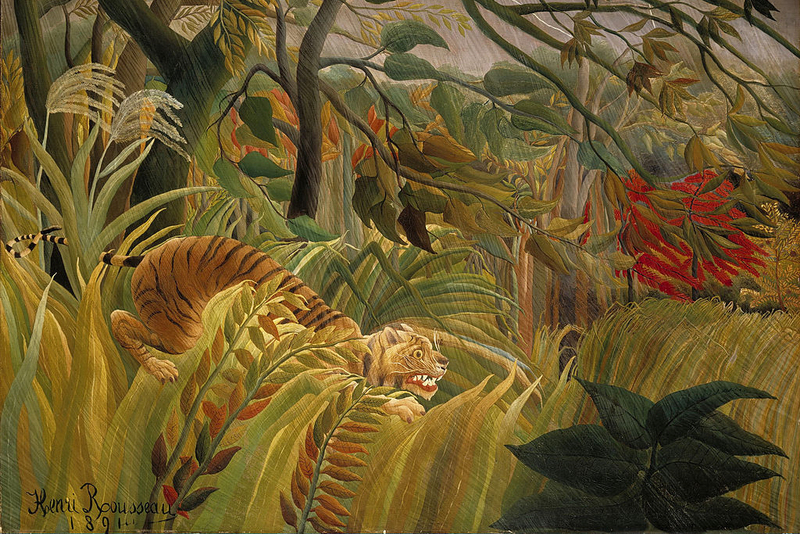 Rousseau became famous for his tropical paintings, making people believe that he spent a considerable amount of time exploring distant lands and exotic jungles. It turns out the artist had actually never left France, and reached fame by being inspired by surrounding gardens, botanical textbooks, and stories from others. It just goes to show how a little bit of nature can inspire your imagination and an entire oeuvre of work. Paul Cezanne spent his later years painting in Aix-en-Provence, France, inspired by the beautiful landscape above. 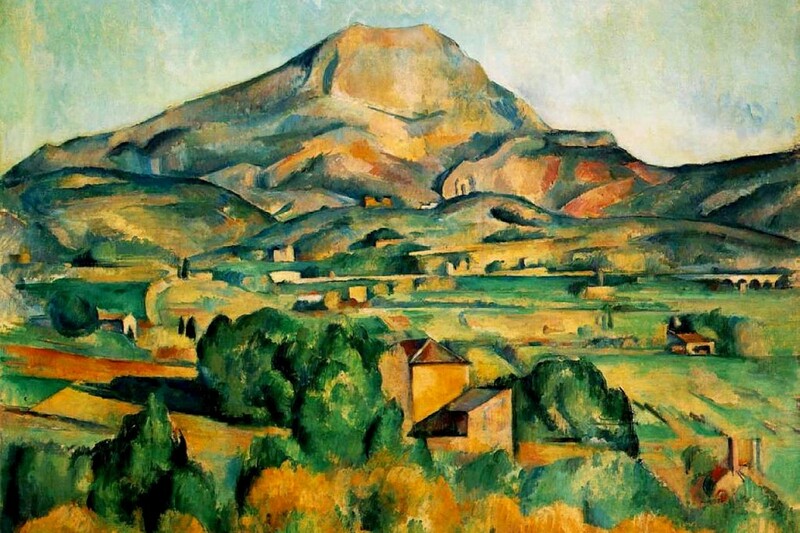 Cezanne sought to depict human forms and buildings as simply an extension from the natural landscape — blending in almost seamlessly to the side of the hills — the inherent quality of the landscape giving it its light and color. We, humans, are but visitors on this sacred earth. 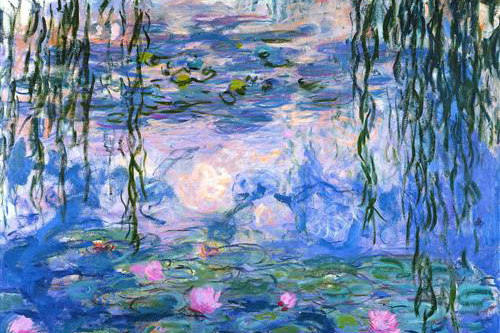 One of the most famous nature painting series is Monet’s Water Lilies, which is a gentle play of light, water, and shadow. These were a series of nearly 250 oil paintings that depict the Impressionist artist’s flower garden in Giverny, France. They were the main focus of his work during the last 30 years of his life. What’s most inspiring about them is how different each painting in the series is from the other — nature is so fleeting, always changing and transforming, colors and lights moving in ways that can never fully be captured yet toy with the imagination. Georgia O’Keeffe was famous for her abstracted paintings of the American desert, but not many people know she spent several months in Maui, one of the lush islands of Hawaii (she was there on assignment for a pineapple company but spent most of her time painting the gorgeous landscape). 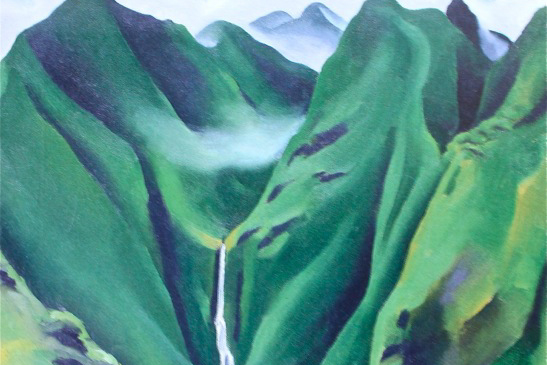 The painting above serves as a tribute to a land largely untouched by human development or pollution — seeing the purity of the landscape is something of a religious experience for anyone who can get the chance to go to Hawaii. It’s images like these that remind us how important it is to conserve the natural earth. 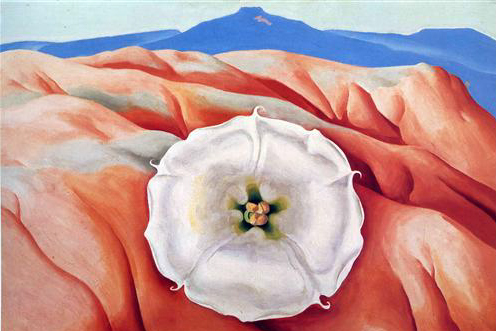 More familiar are Georgia O’Keeffe’s paintings inspired by her time in New Mexico, surrounded by a harsh but beautiful desert landscape. O’Keeffe was so tired of city living that she permanently moved to New Mexico in 1949, where she could see scenes like this in her front yard every day. Frank Llloyd Wright harbored a great respect for nature in his work, and believed that human buildings and architecture should harmoniously connect with and benefit the land around it. His pioneering thoughts have inspired architects and artists to follow in his footsteps in maintaining the environment while merging it with art. “A building should appear to grow easily from its site and be shaped to harmonize with its surroundings if Nature is manifest there,” he once said. Robert Smithson was famous for being one of the first to undertake “land art” or “earthworks.” In Spiral Jetty, he constructed a giant swirl out of mud, rocks, and salt crystals jutting into the Great Salt Lake in Utah. The earthwork disappears then reappears, depending on precipitation and the tide. When there’s a drought, the jetty is more visible while normal precipitation keeps it submerged; and every time it reappears it is slightly different. It reflects the transient and changing nature of the earth. The Lightning Field is a truly unique art piece consisting of 400 metal rods placed apart in the middle of an empty field in New Mexico. These metal rods attract lightning fairly often, since they're the tallest things around for miles around; visitors are invited to spend the night in a cabin then wait for lightning to strike. The artwork, which lives and breathes in the outdoors, cannot be confined by gallery walls — and reflects the power and unpredictability of nature. Ana Mendieta was a performance artist and photographer focused primarily on her spiritual and physical connection with the earth. In Earth Body, she documents herself merged into nature in various sculptural forms, bridging the gap between performance art, sculpture, and land art.